Our client has created a web based loyalty management platform, with initial deployment in the restaurant industry, which allows local restaurants to easily promote deals and for consumers to find them in and round their geographic location using either their mobile devices or the web. Our client’s mission was to improve the online and mobile experience of both consumers and restaurants. 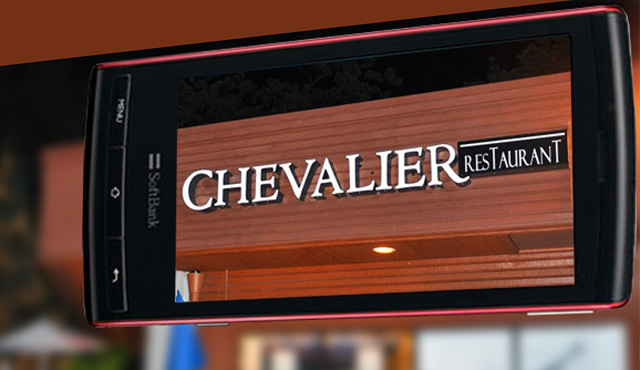 Our client realized that the restaurateurs’ reach and their opportunity to engage with repeat customers would increase significantly by using mobile and web and social networking channels. Our client wanted to target all possible mobile market by releasing its mobile solution on multiple platforms. Having recently released the application on iPhone our client now wanted to implement the same solution on Android Smartphones. Our client wanted to provide the users a similar rich experience while accessing the applications from either of the mobile platforms. Our client also wanted to ensure that the application be easily deployed on other mobile platforms without many changes. Real time “Deal” information to customers - Our client wanted to facilitate restaurateurs to announce coupons ‘On the Go’ attract consumers during their leaner periods and supply and update real time information to the customers. Building application compatibility for different mobile handsets of the Android platform. The User Interface should address different Android handset screen resolutions that will be “eye candy” and user friendly. Our client wanted to integrate as applicable any new features that were being released as part of Android SDK updates. Connecting via text: US has many mobile vendors like AT&T, Verizon etc. All vendors have different T&C and our client wanted to display specific T&C as per end user mobile service provider. Xoriant’s team worked closely with our client to understand the requirements and created an engagement roadmap. The engagement roadmap was planned with due consideration to engagement objectives and some key decisions were taken early in the engagement cycle. Decided to form a team with right blend of skills in the areas of architecture, development, User Interface experts, QA engineers. Over and above the technology capabilities, our client was looking for a partner which will “own” the end to end deliverables with little or no hand-holding. Xoriant had worked with many clients in similar model, which was a perfect foundation for a successful engagement. Xoriant team initiated the work to come up with solution blueprint. We leveraged our technology and platform expertise to deliver an innovative solution to our client that offered seamless user experience for customers through native Android phone application. Xoriant team worked with our client team to find a solution that would enable it to integrate with 3rd party service providers reliably and inexpensively. 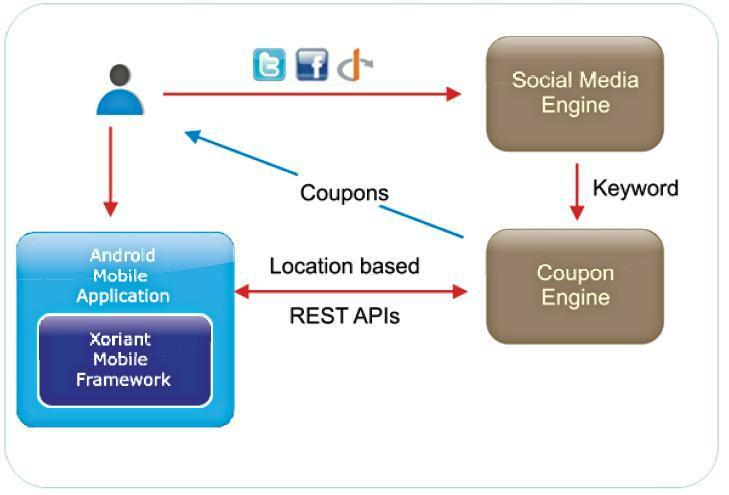 Our client’s main focus was to experiment with Location Based (LB) coupon distribution using emerging ideas of social media (Facebook, Twitter) via the Android application. Our client wanted a solution applicable for multiple mobile platforms to allow wider reach. Xoriant recommended Secure API based REST architecture for achieving this. This architecture allowed mobile application to access the information, thus making the server side platform independent. Our team developed a product that makes a unique and smart use of Facebook Connect. If a user logs in using Facebook Connect then his profile information (keywords) are pulled and fed into a coupon engine and relevant coupons are posted in the form of wall posts. This product also exploits the Geo location feature launched by Twitter. Tweets in the form of call back URLs are tagged with location and are tweeted using the client user account. This product is a location based service and senses user location on Smartphones. Our team utilized the Xoriant framework “Smartphone App Accelerator” for Android. This framework provides ready to use components/modules that address common application functionality like Networking, Authentication, Parsing, File/Database access, Camera, GPS and other sensor functionalities. These high quality and well tested components were used as fundamental building blocks by the application developers to speed up development. As new Android features are released, our framework team integrates them into the Smartphone App Accelerator for Android, thereby enhancing it continuously. The framework components offered basic pre-built functionality of the mobile phones, thereby allowing the developers more time to focus on functionality and usability. Cloud computing solution from Amazon was used to minimize the infrastructure cost. Besides the reduced cost, it gave our client more flexibility, ease of operations and automation. Our system administrators contributed in making optimal utilization of cloud. Our client was able to launch the beta version of the product in 3 months and it was widely accepted by user community. Xoriant’s proprietary Mobile framework “Xoriant Mobile App Accelerator” was a key to achieve this timeline for mobile applications. The solution designed was platform independent leveraging the power of mobile and web. Our client was able to achieve seamless integration with mobile applications and social media tools. User experience was well received after the beta launch. Xoriant provided simple and highly cost effective solution to our client by incorporating open-source and free technologies. Xoriant understands that any product on the web has to extend to mobile. The Xoriant team made the development of native Mobile Apps on iPhone and Android easy. They have deep expertise in each of the mobile platforms including in-depth understanding of architecture and UI. Even though a framework was used, the look and feel of the application on the iPhone and Android platforms looked as if it was built from scratch on each device.